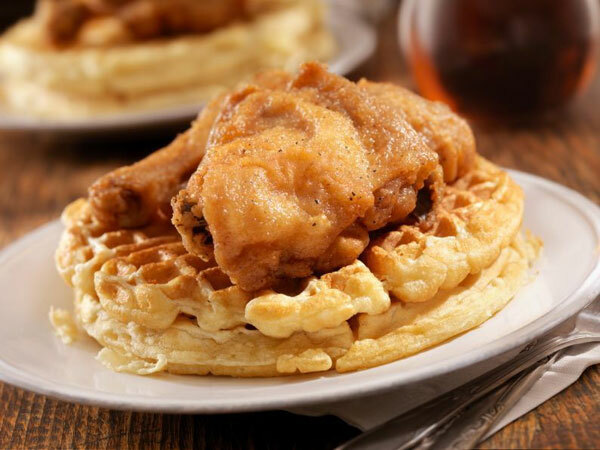 To explore the history of this dish, we can start by breaking it down into its two basic elements – fried chicken and waffles. Let’s start with fried chicken, which shows up in its earliest form as a fricassee—fried chicken pieces braised in sauce. Fricassee was popular in the Mediterranean basin during the medieval period. To make fricassee required an iron pot, meat, and fat, all of which were readily available during the time period. By the 1300’s, friquasée, a combination of the French words for “fry” and “break,” began appearing in French culinary writings. Early cookbooks like Le Viandier feature recipes for fricassee that can be made with any meat, not just chicken. By the 17th century, recipes more frequently called for chicken. In fact, first lady Martha Washington had two recipes for fricassee in her recipe collection, one of which requires a half pound of butter to fry two cut-up chickens. Another popular cookbook of the colonial time period, The Art of Cookery by Hannah Glasse, features a recipe for “Brown Fricasey,” a dish of chicken pieces coated first with egg, then spiced breadcrumbs, then fried in butter. Starting to sound familiar? Once the chicken was done frying to a crispy brown, it was doused with a healthy serving of gravy, mushrooms and pickles. Glasse’s preparation went on to influence many other recipes, included the breaded and fried chicken we are familiar with today. From the colonial period through the early 1800’s, African slaves were doing most of the cooking in Southern kitchens. At that time, chicken was considered a prestigious food within the African American community, and it was more expensive than some other meats. Enslaved cooks would make fricassee recipes from the popular cookbooks of the time period, or they’d take it upon themselves to fry the chicken in the way they knew best. When the Civil War began and men left their homes to become soldiers, fried chicken took on a new significance. The frying process made chicken less prone to spoilage, allowing women to send it to soldiers fighting in the battlefield. In 1881, in her book What Mrs. Fisher Knows About Old Southern Cooking, African American cook Abby Fisher shared a recipe for fried chicken. Her version involves flour, fat, and a finishing of thin gravy. By then, most fried chicken recipes had moved beyond the fricassee, and did not require an extra braise in sauce at the end of cooking. With the advent of the automobile, roadside diners and restaurants began appearing in droves, and fried chicken was on most menus. In the 1940s, Harlan Sanders, better known as Colonel Sanders, developed his signature fried chicken recipe. By 1952, his popular Kentucky Fried Chicken franchise helped to make fried chicken a common treat in households across the country. Tori’s recipe for Chicken and Waffles is available on The History Kitchen blog. Tori Avey is a food writer, recipe developer, and the creator of two cooking websites: The History Kitchen and The Shiksa in the Kitchen. She explores the story behind the food – why we eat what we eat, how the foods of different cultures have evolved, and how yesterday’s food can inspire us in the kitchen today. 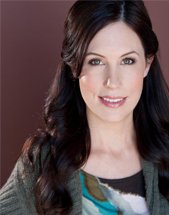 Tori’s food writing and photography have appeared on the websites of CNN, Bon Appetit, Zabar’s, Williams-Sonoma, Yahoo Shine, LA Weekly and The Huffington Post. Follow Tori on Facebook: The Shiksa or Twitter: @theshiksa.